Will Phony Populists Hijack the Fight Against Inequality? 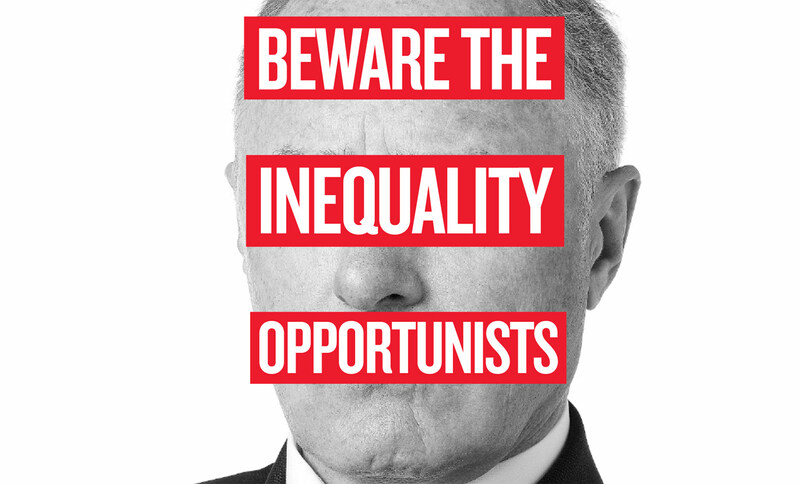 These days everyone wants to ‘create opportunity,’ but few want a class war. In late January, President Obama met some two dozen CEOs at the White House to discuss the plight of the long-term unemployed. Frustrated by the refusal of congressional Republicans to extend unemployment insurance benefits, Obama persuaded several hundred companies to sign a “best practices” hiring pledge promising not to discriminate against those who have been unable to find work for a lengthy period of time. Among the executives present was Don Thompson, who made nearly $14 million in 2012 as the CEO of the McDonald’s Corporation, and whose restaurant workers are paid so little that they must rely on $1.2 billion in public assistance each year. Also present was Boeing CEO Jim McNerney, who earned $23.3 million in 2013 while threatening to move his company to a right-to-work state if the machinists’ union did not accept a contract that froze pensions and limited future raises. Walmart, which last year chose to buy back $7.6 billion of its own stock when it could have raised employee pay by more than $5 an hour instead, signed the agreement, as did JPMorgan Chase and Bank of America, whose fraudulent mortgage practices helped tank the economy and destroy decades of middle-class wealth. “I was really grateful to all of them for stepping up in this way,” Obama said. The confab neatly illustrated the Democratic Party’s current predicament. As public disgust with rising inequality and a protracted jobs crisis compels a populist approach to governing and campaigning, the party remains inextricably tied to some of the elites responsible for the underlying problems. Publicly, the party seems united—but who is truly dedicated to reversing the country’s alarming descent into oligarchy, and who is just using the issue of the day to burnish their credentials or troll for votes? The gloss of consensus, however, obscures deep divisions about inequality—including the explanation for its origins. Progressives like Massachusetts Senator Elizabeth Warren explain concentrated wealth as the result of a rigged system that funnels the gains from workers’ productivity to their bosses. On the other hand, a competing story of American inequality has emerged—one that “basically says it’s something happening out there, to us, and if we are at fault, it is only that we have been slow in responding to what’s happened,” observes economist and Nobel laureate Joseph Stiglitz. This is the narrative Barack Obama frequently offers. “Over more than three decades, even before the Great Recession hit, massive shifts in technology and global competition had eliminated a lot of good, middle-class jobs and weakened the economic foundations that families depend on,” he said in his recent State of the Union address. Robert Borosage, the co-director of the progressive think tank Institute for America’s Future, calls this “passive-voice populism”—a version of events that neatly elides talking about the deliberate policy decisions that have led to increasingly unchecked corporate power. CNN’s Fareed Zakaria, for example, argues that when it comes to inequality, there is “a powerful story to be told about how technology, globalization, and declining American education and skills have contributed to the stagnation of wages for the median worker.” The New York Times’ Thomas Friedman also repeatedly blames an untrained workforce for the country’s widespread unemployment, despite lacking evidence of a labor shortage. Proponents of this viewpoint rarely, if ever, mention the declining bargaining power of the American worker—one of the chief causes of income inequality. The Economic Policy Institute found that the decline of unions accounts for about three-quarters of the increased wage gap between white- and blue-collar male workers from 1978 to 2011. Yet that fact remains virtually unmentioned in the “inevitable globalization” version of events. Not surprisingly, people who perceive wealth at the top as being disconnected from the losses in the middle and at the bottom have put forward solutions that fail to address the structural basis of the inequality crisis. In fact, the center-left’s inequality agenda depends on a modified trickle-down model, in which special treatment for the corporate class—people like Don Thompson and Jim McNerney—is the solution, rather than part of the problem. Former New York Times editor Bill Keller, a self-appointed spokesman for the center-left, called for an inequality agenda aimed at “unleash[ing] the energy of the private sector.” Similarly, Al From, founder of the Democratic Leadership Council, claims that “without private sector growth, a redistribution strategy is self-defeating. That’s why Democrats cannot afford to lose our appreciation for business and the private sector.” While From ostensibly welcomes a populist campaign, he nevertheless advocates slashing Social Security and Medicare in his recent memoir. The president himself has made a subtle shift in language, moving away from talking about inequality explicitly and instead speaking in terms of “opportunity.” The Obama economic agenda outlined of late has many echoes of the Keller approach: he wants revenue-neutral tax reform that would lower overall rates and bring home the money that corporations have stashed overseas at a fraction of the standard tax rate. The Obama administration is also pushing hard for more liberalized trade in the form of the Trans-Pacific Partnership (leaked drafts of which indicate that it contains substantial deregulatory language, including for the financial sector), while maintaining a stubborn insistence on deficit reduction. Although it took Social Security cuts out of its recent budget, the administration has expressed a desire to enact them should Republicans come to the table. Most Democrats, from Obama to Summers, do favor some laudable measures to reduce inequality, such as closing tax loopholes that benefit the very wealthy, raising the minimum wage and strengthening the safety net for the very poor. Those are good policies, but they are not aimed at fundamentally changing the structure of the increasingly skewed economy. “Some of this is just getting back what we lost—just recently lost, not since 1968,” says Dean Baker of the Center for Economic and Policy Research. “It’s not a game-changer.” CEOs would be forced to spread a bit more of their profits around, but they’d still be winning the game. Essentially, such proposals square with the strategy advocated by Zakaria. “This strikes me as the right approach: how to get people to move up and thus create a thriving middle class. If, in the process, the Google guys stay rich, so be it,” he has said. Incidentally, the “Google guys” constitute an emerging power center in the Democratic Party. A group of Silicon Valley moguls—led by Sean Parker, a Facebook investor and one of the founders of FWD.us; Ro Khanna, a lawyer and former Commerce Department deputy assistant secretary; and Shervin Pishevar, a venture capitalist—are at the forefront of a concentrated effort to increase the clout that the tech sector wields on a broad range of issues. Citing a sense of social conscience, they are funding political advocacy groups, advising the White House, writing legislation, spending millions on lobbying and even—in the case of Khanna—running for office themselves. “We need to put our heads together and seize control over this system, quickly and stealthily, before incumbent players wake up to what’s happening,” Parker said last year. But it’s not clear that this Silicon Valley “populism” extends far beyond the tech sector’s specific interests. Even the moguls who acknowledge inequality seem blithely oblivious to its scale—and to their own complicity. Twitter co-founder Jack Dorsey, for example, acknowledged that companies like his bear some responsibility for the deepening economic divide in San Francisco; he has also said that one of the remedial efforts he was most proud of was starting a weekly neighborhood outing to pick up the trash. Then there’s the main “Google guy,” chairman Eric Schmidt (net worth: $8 billion), a major Democratic donor who said in 2012 that he was “very proud” of his company’s tax practices, which shield billions annually from the federal government. But even with the favoritism Schmidt is calling for, past results suggest the gazelles will not live up to their promise as job creators. Silicon Valley has generated only 30,000 tech-related positions since 2008, while the region lost more than 40,000 manufacturing jobs in little more than a decade. Google’s $380 billion market cap is about seven times greater than General Motors’, but GM employs more than four times as many workers. Meanwhile, WhatsApp—which Facebook bought in February for $19 billion—employs just fifty people. Schmidt sees no problem with the imbalance. As he said at SXSW, “Let us celebrate capitalism: $19 billion for fifty people? Good for them.” Schmidt’s inequality agenda is opportunism at its most crass: it may make him and his friends even richer, but it’s no prescription for full employment or higher wages for the masses. These days, every politician wants to be a populist, but few want a class war. The essential question for Democrats is whether or not an effective policy response demands one. Unserious contributions like Schmidt’s, if accepted as “populist” policy, threaten to reduce a question of justice to a discussion of how the 1 percent can have its cake and put its fingers in the populist pie, too. But when progressives like Warren talk about breaking up the “too big to fail” banks, reforming corporate governance structures or tying wages to productivity, they are calling for a deep rupturing of the pact that Democrats have made with the corporate elite. Many party centrists aren’t ready to end the affair. “The essential problem with the Democratic Party is that you have, for a variety of reasons, a wide number of Democrats who are also dependent on corporate interests for their funding and their support and, you know, have not come down clearly on the side of working families,” says Bernie Sanders, one of the Senate’s most stalwart progressives. Of serious concern now is the prospect that those who don’t really want to address fundamental inequities will push Washington away from even modest reforms at the first possible opportunity. The backlash could come after the fall’s midterm elections, in which Democrats are forecast to fare poorly, due in large part to gerrymandering and a number of Senate swing races happening almost exclusively in red states. The critical task, then, lies in building a national movement strong enough to convince the Democrats that making a real commitment to workers and the poor is not only a moral but a political imperative. Heather McGhee, the president of the social justice policy organization Demos, notes that “politicians are opportunists—we just have to keep telling them this is the best opportunity, over and over again.” The willingness of tens of thousands of low-wage workers to walk off the job is what pushed the Democrats to embrace a wage hike as a rallying cry for 2014, and Obama to raise the minimum wage for federal contractors. Zoë CarpenterTwitterZoë Carpenter is The Nation’s associate Washington editor.